While doing laundry, there are a lot of things to consider. From shrinking to fading, there’s a lot that can go wrong with a load of laundry. White fabric can turn pink if it gets washed with red fabric that bleeds. Dark and black fabric can fade, so use special care while washing so your clothes retain their color. 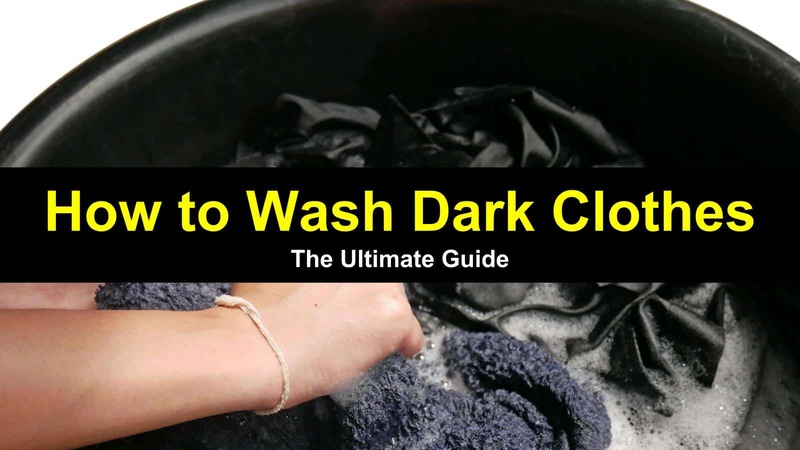 In this article, we’re going to go over how to wash dark clothes. We’re assuming you’re using a washer and dryer rather than a hand wash method. Because helping your dark clothes retain their colors has a couple of steps, we’re also going to cover other topics as well. We’re going to see what temperature to wash dark clothes and how to keep black clothes from fading. Ultimately, you’re going to know how to keep your dark clothing in tip-top shape, even after you’ve done numerous washes. When you wash dark clothing, it can bleed its dye and therefore lose some of its colors. The more you wash them, the more they will fade. To keep your darks and blacks looking as good as the day you bought them, take special precautions on laundry day to protect them. 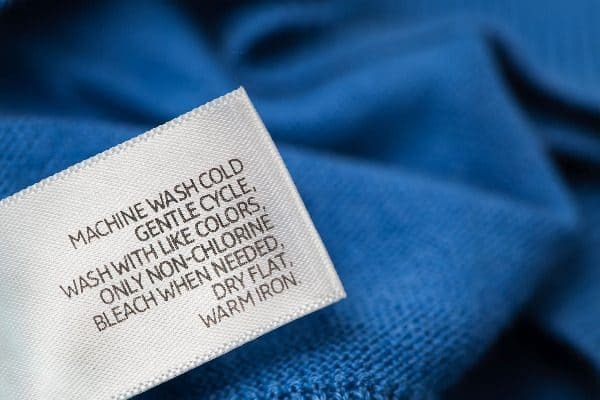 Before you throw your dirty laundry into the washing machine, be sure to read the clothing labels to make sure you use the correct washing procedures for each type of garment. Sort all dark clothing into separate laundry baskets or piles, being sure to separate delicate items from more sturdy items like denim jeans. It is the best way to sort laundry. Sorting ensures that your clothes don’t get misshapen in the washer. Plus, you’ll want to use the gentle cycle for delicates and heavier cycles for sturdier items. While you can wash dark clothing in the washing machine with other color loads, it is best to give them a cycle of their own. Separating clothes keeps the amount of clothing in the washing machine manageable and reduces the amount that your clothing will rub against each other. Turn all dark items inside out, which will keep the outside of your clothing looking nice, and exposes the visible side to less water, detergent and agitation. Washing your garments in cold water (80 degrees) rather than hot water is the best thing you can do. Hot water tends to cause the dark fabric to run. The wrong temperature can result in fabric shrinking. Cold water not only helps the dark clothing keep their pigment, but it is also the most ecologically friendly. You can always try to unshrink your dark clothes in case you washed it wrong, but keep in mind that using the right temperature in the first place, will save you a lot of hassle. Your washer uses a lot more energy heating up warm water, so using cold water uses less energy. Some people choose to wash all their laundry in cold water temperature. You want to use the correct laundry detergent for dark fabric. 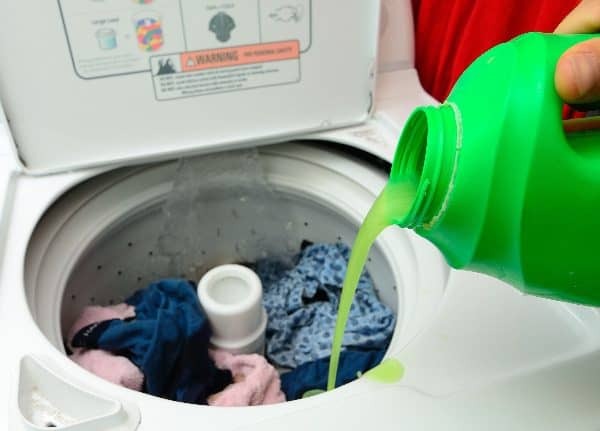 Make sure it is not a detergent with bleach added, not even if labeled as color safe. A mild detergent without anything added is best for dark clothing. Measure the laundry detergent out carefully and take care not to use too much, as it may not wash out completely. You need a lot less than you think you will, especially if it is a high-efficiency detergent. Be sure that you use laundry detergent for HE washers if you have one of these models. Special liquid detergent works better for dark clothing than powdered. If you use powdered, put it in the water before putting your clothes in, so it has time to dissolve, as powdered laundry detergent doesn’t dissolve as well in cold water. You can also add some vinegar to your wash to preserve dark coloring. Put the washer on the correct cycle for the type of fabric. Use a delicate wash cycle for more delicate fabric, and a higher setting for sturdier fabric. You can wash dark jeans on a delicate water cycle to help preserve their color and shape. Do not wash your dark clothing more often than necessary. Even oil stains can usually be gotten out without putting your item of clothing in the wash. Use oxygen bleach or non-chlorine bleach instead of color safe bleach, if you must use bleach at all. If necessary you can get the bleach out of clothes but it is a rather difficult procedure. Make sure your water is not too hard for your laundry as well. Hard water can damage clothes and lessen the power of detergent. If you have hard water, you can buy special detergents, like those best for cold water, to remedy the problem, or use a water softener. Residual soapy water can also make your dark clothes appear dull, so you might also consider adding a 1/2 cup of white vinegar to the final wash cycle to take care of the residue. If, despite your best efforts, your dark garment bled onto other clothing, do not put them in the dryer, as this will set the dye and cause stains. Rewash them before drying. Try not to run dark clothing through the dryer more than necessary. It’s a good idea to hang dry most dark articles of clothing instead of running them through a hot drying cycle. If you must use a dryer, set it to the lowest heat possible to avoid fading, below 130 degrees. 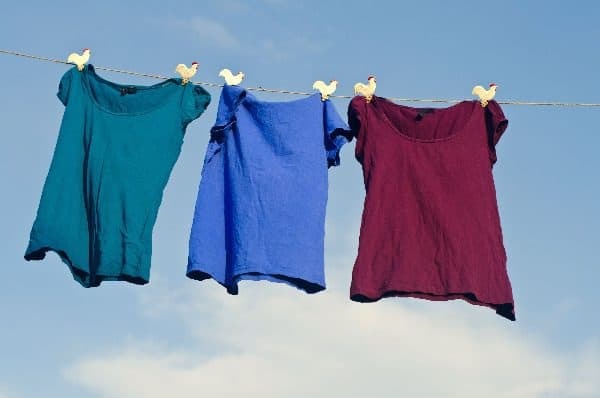 Avoid putting your dark clothing on a drying line, as the sun can fade dark colors. If your clothing is dry clean only, try not to take them too often. The high heat dry cleaners use can also fade your clothing. On top of the above tips, if you want to keep your black clothes from fading, only wash them when necessary. When you’re getting ready to do laundry for the week, take a look at your dark clothes and figure out if they need washing. If you can go another week without washing them, do it — the fewer times you wash your dark clothes, the better, as they lose dye with every trip to through the laundry machine. Never be afraid of bleeding or fading clothes again. There are safe methods to washing all clothes to ensure they stay as brilliant or dark as when you bought them, and it will avoid stains on your other clothes. 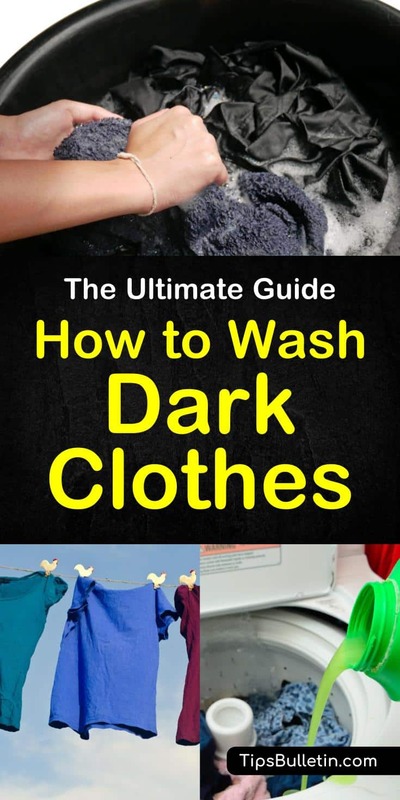 In this article, you learned how to wash dark clothes. You learned what temperature to wash dark clothes and how to keep black clothes from fading. Did I miss anything? Let me know in the comments, and use the buttons below to share to Facebook, Twitter, and Pinterest!